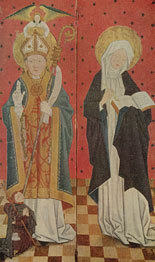 Saint Birgitta was born in 1303 on Finsta manor in Uppland. She was a daughter to Birger Persson, who was a courtman in Uppland, a member of the King's council and a big landowner. Her mother's name was Ingeborg Bengtsdotter and she was related to the royal family. Birgitta's mother died when Birgitta was very young. Then she was sent to her aunt in Ostergotland. Even as a child Birgitta was very religious and had a few revelations. As a seven-year-old girl she had to face a vision where virgin Mary put a crown on her head. When she was ten years old she saw the crucified Christ in a vision, for the first time. In fact Birgitta wanted to enter a convent. But when she was thirteen she was married off to the courtman Ulf Gudmarsson. They lived in Ulfasa manor in Ostergotland and she got children, four sons and four daughters. Birgitta has described how she raised her children. She didn´t hit them and sometimes the children got a reward when they had done something great. At Ulvasa Birgitta took care of and helped women who had been left outside the society, for example unmarried women with children. Birgitta was a related to the King and lived at times at court with King Magnus Eriksson and his Queen Blanka. The King and his Queen later left the State demesne of Vadstena to Birgitta for the building of the convent (1346). Both Ulf and Birgitta were very religious. They went on many pilgrimages together to sacred places. 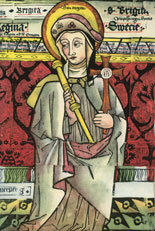 After a trip to Saint Jacob's grave in Santiago de Compostela in Spain, Ulf became ill and died in Alvastra monastery in 1344. Birgitta stayed for a while in Alvastra. She started to get revelations and felt called to be "the Bride and Mouthpiece of Christ". She wanted to build a convent for both monks and nuns in Vadstena. 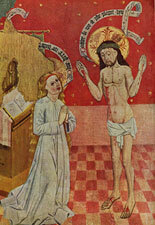 Her 600 revelations were translated into Latin by her confessor Petrus Olai from Alvastra and the teacher Mattias from Linkoping, and collected in a book. The first printed edition came in 1492.